Kaaren, thank you this is going to be just perfect to stitch while I recover. Thank you very much, I'm going to try to found the fabric. I think this is going to be fun to see everyones versions. I won't be doing it but it's a gorgeous pattern and I'll be cheering on the sidelines. Robyn's a sweetie to help out, as you say, bloggers are the best. Thankyou Karen this is just so adorable. I have been waiting patiently for today to arrive! Thanks Kaaren, time to start getting organised..
Oh, Kaaren -- this is adorable!!! This is definitely something I'll be starting before the week is out! Thank you for sharing a fabulous quilt design! Thanl you very much for your lovely bom. Las explicaciones son clarísimas, muchas gracias, estoy deseando empezarlo. Thanks for this first block, I just love this pattern. Thanks Kaaren, I have now to choose fabrics for your beautiful design. Thank you, Kaaren! This will be a lovely project. Kaaren thank you very much for this beautiful pattern ! so cute! thank you for allowing us to share in your talents. This will be fun to do!! Thanks for the neat BOM. WooHoo - it's time! I've been waiting on pins and needles for this day. Thank you, thank you, Kaaren for sharing your talent. I think hundreds of bloggers will be making this darling quilt. Robyn is terrific. I printed out the pattern. You have spent a lot of time preparing the drawings and directions for us. Very kind of you. I have been looking forward to this BOM for a good while. Thank you! Oh, thank you Karen!! I love Raggedy and her friends also. I was director of a day care ministry for several years and one of my favorite series of books to read to the children was Raggedy Ann. I'm looking forward to doing this quilt. Don't know where I'll find the time but at least it will be on my to do list. Thanks so much for sharing "freely". Love your Friday Freebies too. Thank you again, Kaaren for sharing your creative talent with us. Can't wait to get it started. Have a great day. I can't wait to get started! Thanks again Kaaren. So cute Kaaren. I'm going to add the button to my sidebar and download the instructions, thanks so much for this fun pattern. Thank you for sharing this, I just found you thru another blog. What can I say, but "Thank You". This is going to be fun! I think I've fallen in love with these little people. Is this my second childhood? I can hope!!! 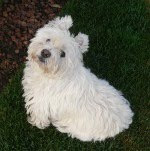 Hello Kaaren,thank you and a special thanks to Robyn for helping you.Happy days. Thanks Karen, for this gift so special, and start this fun adventure and I'm sure I'll enjoy super. Let the game's begin...it will be fun to see these all over blogland this next year!! Karen, Thank you for the BOM. Who doesn't love and feel comforted by the nostalgia of Raggedy Ann. I'm sure we'll all get great enjoyment. Thanks again for the work you've put into the project. Thanks so much for sharing this wonderful BOM!! I just love it and can wait to whip it up!! Can't believe it's the 20th already!! Yikes~ the summer is whizzing by!! Kaaren, this is a refreshing project that I will look forward to. Thanks for the stitcheries and the fun ahead as we all quilt together. Kaaren, thank you so much, i can't wait to start! i did some redwork last year, a little christmas wall hanging, and loved it.....thank you SO much! Kaaren, you are so generous to share your talent. It is a darling quilt. How sweet of you to offer this to us!! I can't wait to make it! Thank you so much!! Kaaren - thank you so much. I am looking forward to this. I think my daughter is going to stitch it and I will piece and quilt it. Thank you so much Kaaren! Love this quilt. 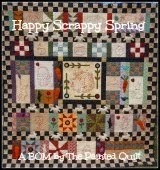 Really enjoyed looking at the quilting--the feathers in the border and the stippling round Raggedy Ann and Andy. 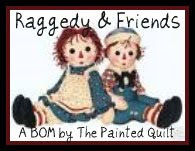 Thank you for sharing the Raggedy Ann and Andy BOM with us. It is really wonderful. I can't wait to see the next one. Thanks so much for the adorable pattern...it is going to be fun to make and probably will have to give it to one of my grand-daughters! You are so talented! Amazing and generous Kaaren - thank you! Cutest Ever - oh Kaaren thank you so much!!!!!!!!!! Got the button on my blog! Kaaren, this is looking so fantastic, well done! !Thanks so much for sharing! Wow, thank you Kaaren. My DGD just loves Raggedy Ann. Kaaren!!! Holy Moly how darling!! Here we go!!! Thank you Kaaren. I'm thinking of making it and keeping it for my 1st grandchild. Thanks Kaaren for all your hard work in posting your design. A thank you to Robyn also for her help. I love Raggedy Ann & Andy and this will be a nice quilt to accompany my Ann & Andy collection. So very generous of you to share! THis looks like fun, might do mine differently of course, but I am thinking it would make a nice charity quilt. Can't pass on this one. It's too cute. Thank you, Karen. I've added a button to my sidebar and will be stitching away with you. This is my firts BOM. I like it very much. ah! I'm taking your button design to my blog. Karen, I love your Raggedy and Friends BOM. I am just re-teaching myself to embroidery (due to health issues I have problems with the feeling in my hands). Anyway, I have an old persnickity computer and I can't get PDF files from the 4 shared site. Tried others and it just won't load the program. Is there any other way to get these darling BOM patterns? I'm really wanting to do a quilt with Stitchery blocks in it and oh how I love Anne and Andy, after all, at 60 years old, you know I carried them around with me for years, LOL. When they got to ragged to sleep with my mom mended them and I sat them on my dresser until I was 20 and married, sadly lost them in a move. BUT, the memories are there. Darling pattern, if it can't be done, no problem...I just thought it would be worth asking. Thank you for sharing your beautiful pattern. Love your work :-) ..and you!! ..and was and am very happy to help you my friend. Have been so looking forward to the start....got back from school camp yesterday and guess what the first thing I did was?? ?....you betcha.....it's printed and ready to go! Thanks Kaaren, can't wait to start the journey with you! Thank you Kaaren!! You are so sweet to share this with us! Gracias Kaaren, ya lo guardé y a coser se ha dicho, está preciosa la colcha. ich sage auch mal danke. Ich werde allerdings die Stickereien mit der Maschine machen. Da heißt es vorher wieder "digitaliseren". I love this quilt! thank you so much Kaaren for sharing this beautiful BOM, I really appreciate the effort that went into making this BOM available to us.Bless you! talented and have such a big heart! Thank you so much for sharing this pattern with all of us! My love for Raggedy Ann started when I was a little girl! I was never without a Raggedy Ann! I remember a horrible incident, I left Raggedy Ann outside on a deck chair while I went and played. That night, after a frantic search, we discovered that a dog had shredded my precious doll!! I still remember crying all night long! My Mother went as soon as the store opened and got me a new one! I loved everyone of my dolls! In fact, I had one hid in my suitcase when I had my first baby!! and my middle name is Ann...of course I married a wonderful guy named Andy! I just found this via another blog. I have seen the button around, but finally decided to click it. I am so happy that I did!! How cute this is!! I may not get to start until January, but then I will catch up real quick! I began too late. Sorry. I am almost finishing the 1 Block. 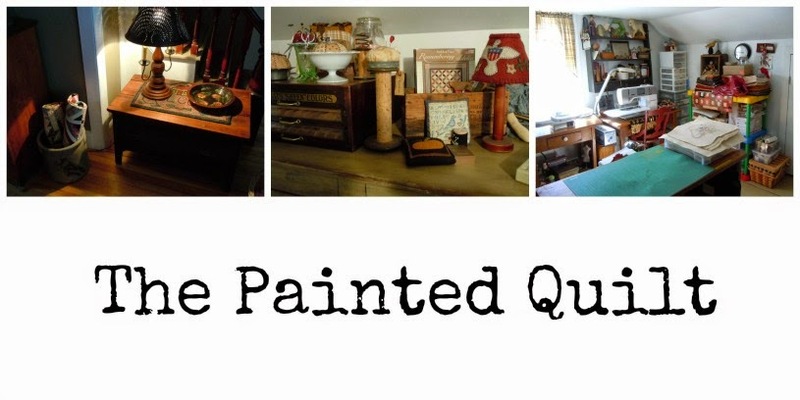 Kaaren, thank you so much for sharing this wonderful project with us. The art work is really lovely.